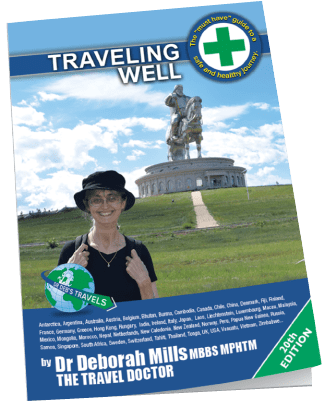 Whether your overseas getaway involves five-star comfort, or being far off the beaten track, or anywhere in between, Travelling Well is your invaluable travelling companion. Dr Deb’s book is now in its 20th edition and is also available as an app for iPhone and android. This work by Dr Deb Mills (ABN 75 624 360 247) is licensed under a Creative Commons Attribution-NoDerivatives 4.0 International License.